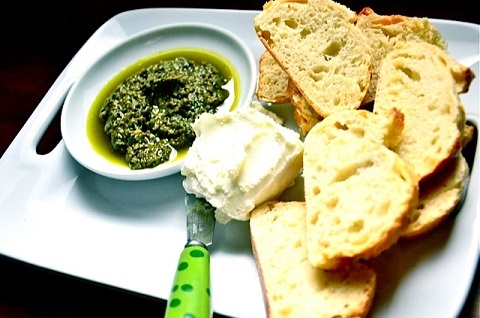 This Appetizer Pesto Sauce with Marinated Mozzarella and Artisan Bread is a fabulously delicious way to keep your guests happy. It is a crowd pleaser that is really easy, especially if you have made the pesto sauce in advance. You can use French bread or almost any Artisan bread you like. The marinated mozzarella cheese can be purchased from most good grocery stores. The pesto sauce is the restaurant sauce recipe on the website. Just click on that link. Serve hot on a tray. Yummmmmy! 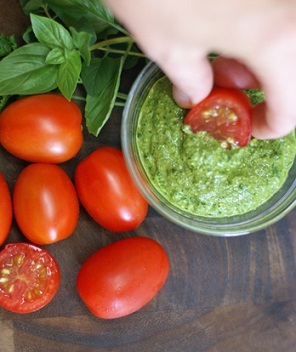 A quality pesto sauce is key to this appetizer. The other thing is to purchase quality cheese. For more restaurant appetizer recipes, visit the main appetizer page. And please remember to visit the main page for sauce recipes for additional ideas. The salsa page will lead you to other recipes. 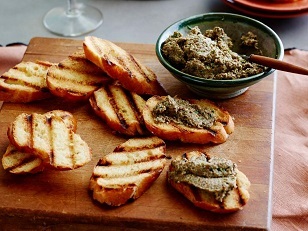 Enjoy your restaurant appetizer recipe using pesto sauce, mozzarella and bread and the company of those you share it with!